Hoo boy, am I ever sick of winter! The local news recently reported that this was, in fact, the coldest February on record in central NY, with an average temperature of 7.2ºF. This breaks the old record of 9.2ºF set WAY back in 1857. So, yeah, we’re freezing, and a lot of us (me!) have a severe case of cabin fever. It’s been so cold that outdoor sports are downright painful. We ventured out on snowshoes on a particularly bitter and blustery day, and within minutes my fingers started to burn from the cold, despite heavy-duty mittens, so back inside we went. Thank god for hot tea, fleece, and flannel sheets. Are YOU sick of winter and looking for a little pick-me-up? Thanks to some sponsorship money from JetPens, I have just the thing— a giveaway sure to warm your heart and your head. 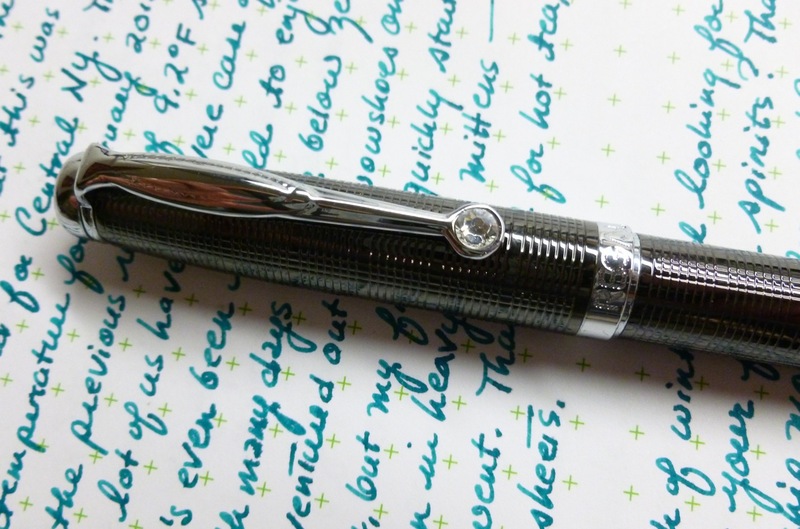 I wrote the rough draft of this review with a Regal 503 Hadrian fountain pen, with a medium nib. This pen popped up in a recent JetPens newsletter and I thought it’d be fun to try out, then give away. The pen’s copper body sports a gunmetal finish, and an etched line pattern, giving it that executive look without the executive price. The pen’s accents are chrome-plated and there’s a Swarovski crystal on the clip for a touch of elegance. (To be honest, the crystal isn’t really my thing, but it’s pretty understated and not too blingy.) 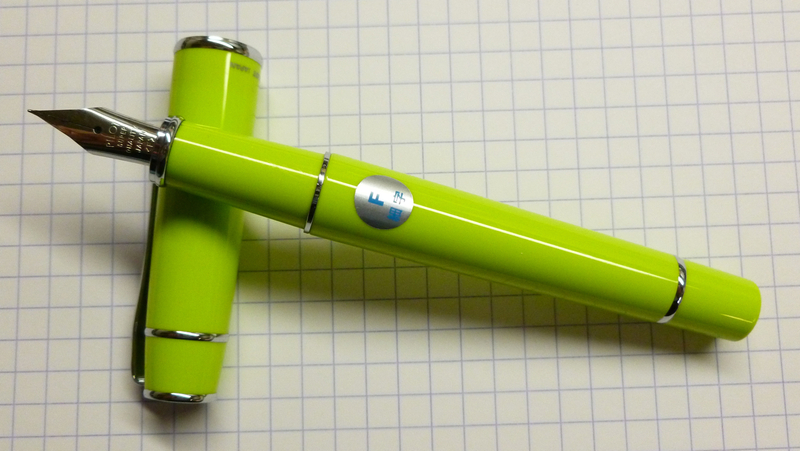 The pen has nice heft and balance, weighing 30.3g capped (16.4g body, 13.9g cap). The snap cap posts securely and is in no danger of wiggling off. Did you know that JetPens sells hats? No? Well, now you do! And because we’re talking about winter and cold weather, I’m going to toss in a couple of these super-cute Jet-Do Mascot Beanies as giveaway prizes. 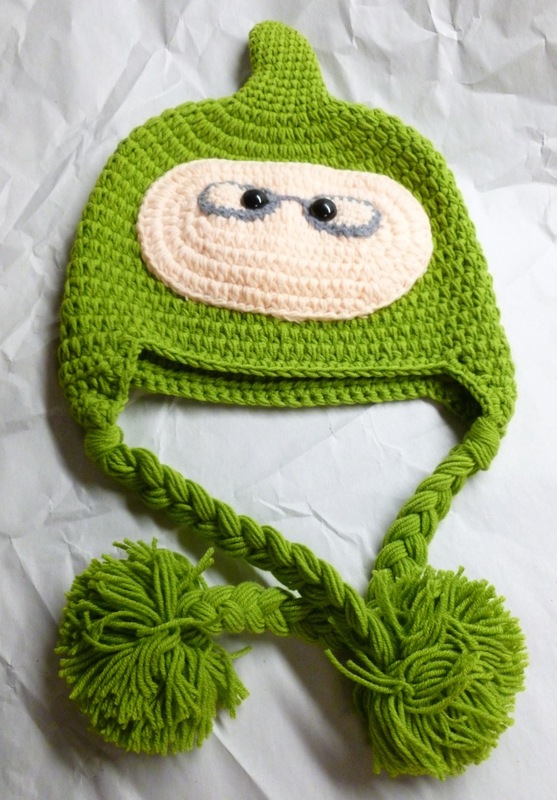 Made of milk cotton, the hats are wonderfully soft, while also being machine washable. Size XL fits most women, while size XXL fits most men (the difference in size looks to be quite minimal). There’s also a medium size, suitable for kids. 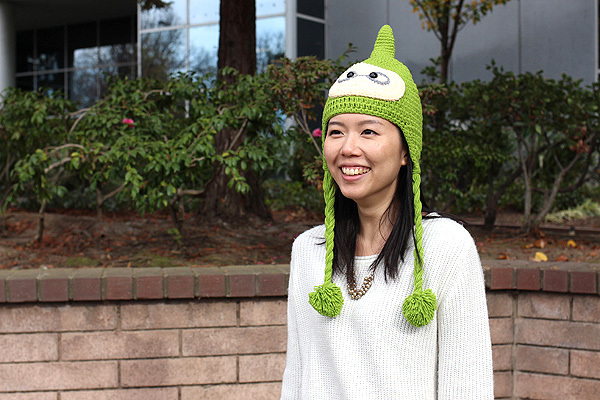 Sure to scare away the March chill with their whimsical good looks, the hats are a great way to show your love for all things JetPens. 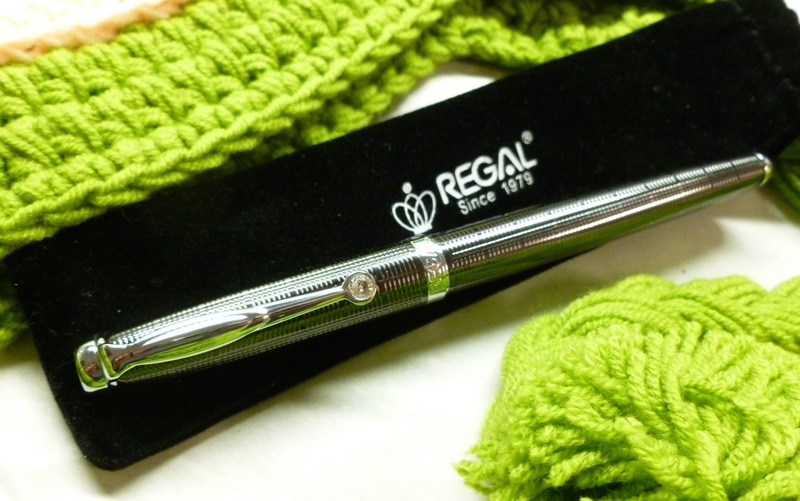 Winner #1 will get BOTH the Regal 503 Hadrian fountain pen, AND one of the hats (choice of XL or XXL). Winner #2 will win the second hat. To ENTER: Just post a comment on this blog— maybe tell me about your favorite JetPens product or products. I’ll assign each comment a sequential number, then will use a random number generator to select TWO winners. Post your comment (one per person, please) by Monday March 9th, 11:59 pm Eastern Time (USA). I’ll select the winners on Tuesday March 10th, and will post their names on the blog. You’ll have a week to get in touch with me with your address so that I can ship your prize to you. The contest is open to US and international readers. Thank you to JetPens for making this giveaway possible, and for bringing us such a wide variety of interesting and useful products. Yes, even hats. The names of all eligible commentors were entered into a spreadsheet, assigned a number, then a Random Number Generator was used to select the winner of Mike Dudek’s The Divide. 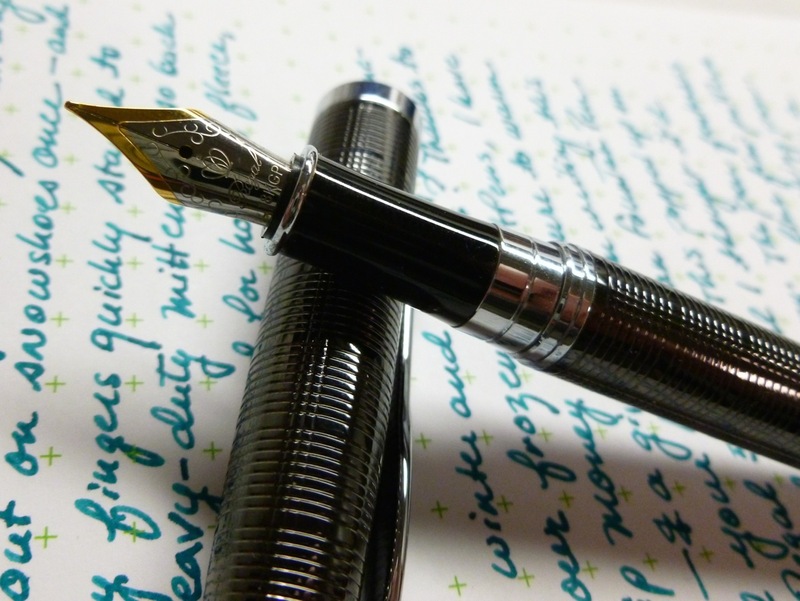 All the pen and pencil blogs I read feed my lust for writing instruments and accessories! I would love to have a Dudek Divide to bring some order to my desk. Ian, your wish for greater order has been granted! I’ll be in touch via email to get your address so that I can pass it along to Mike. Thanks for all who read and left comments. 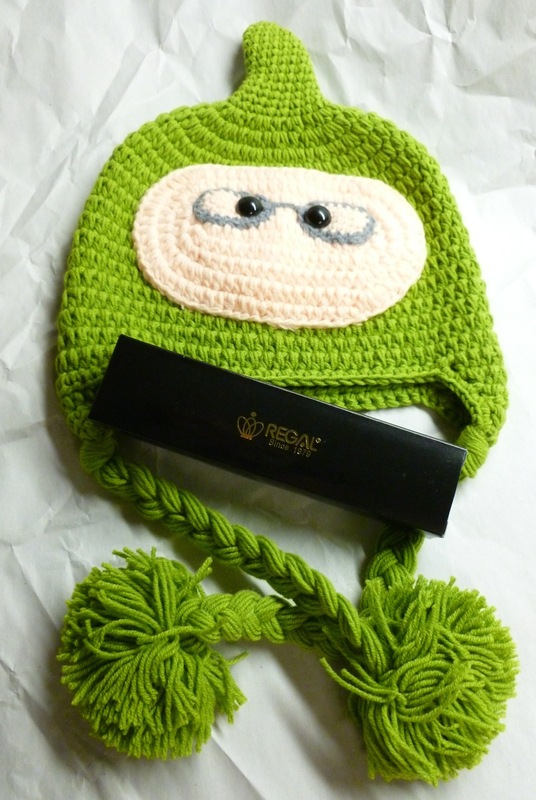 This was, by far, my most popular giveaway. You guys recognize great work when you see it! Giveaway Winner: Write Notepads & Co. 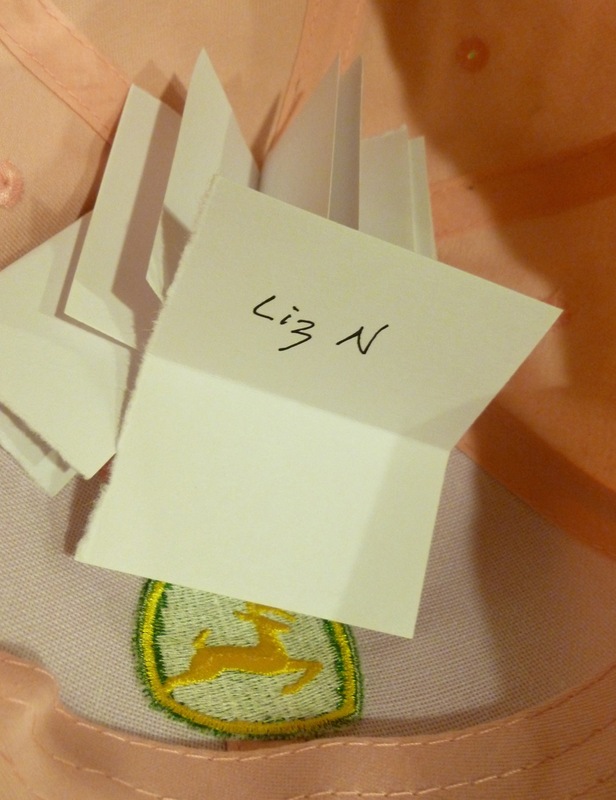 The winner of the Write Notepad Co. notebook and pencils is LIZ N. Fred picked Liz’s name from my pink John Deere baseball cap. (I can’t think of a cap that’s less “me,” but it was free!) Liz, I’ll email you for your address then get the goodies sent off! I loved hearing how you all are making a difference. Liz’s comment said: I really enjoy helping kids stay active so they can have a lifetime of healthy bodies. I volunteered at my daughter’s school for their annual walk-a-thon fundraiser by helping count laps and cheering the kids on. I don’t feel like this is a big deal (compared to some of the comments posted so far! ), but I’m passionate about preventing childhood obesity and making PE/play time/exercise fun again! Your comments prove once again that pen people are good people! NOTE: The Pilot Prera fountain pen reviewed here was provided by JetPens for review purposes and to facilitate this giveaway. The opinions expressed in this review are based on my own observations and experiences. 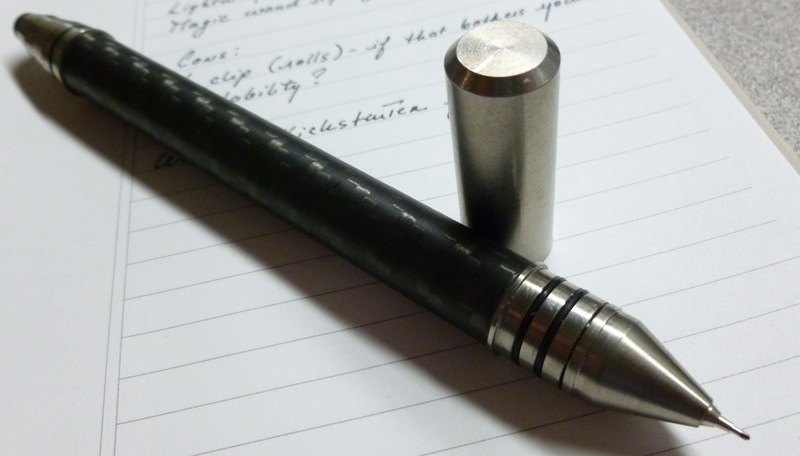 The Pilot Prera is a compact and lightweight pen. Made of sturdy plastic, and weighing in at just 15 grams, this is a pen that you can tuck into your pocket and go about your business without feeling weighed down. Unposted, the Prera is a little on the short side for me, so I almost always use it posted unless I’m jotting a really quick note. Even though this isn’t a large or heavy pen, it would be a mistake to consider it a lightweight when it comes to quality. The Pilot Prera vs. the Lamy 2000; the Prera measures 10.8 cm uncapped, 12.1 cm capped, and 13.4 cm posted. The word “precise” is defined as “marked by exactness and accuracy of expression or detail,” and that particular definition absolutely applies to this pen. One of the best features of the Prera is the slip cap that snaps on with a very satisfying click— like there’s a tiny bit of vacuum drawing it into place. (My imagination, no doubt, but that’s what it feels like.) Once in place, the cap stays put and doesn’t wiggle free. There’s an inner seal in the cap that helps keep the nib from drying out, and I’ve had no hard-starting issues after a day or two of non-use. The cap also posts securely and hasn’t ever worked loose while I’m writing (pet peeve!). The fine steel nib on this Prera is super crisp— even finer than the EF nib on my Lamy 2000 and the F nib on my Pilot Vanishing Point. I’d judge that it lays down about a 0.3-0.4 mm line. Despite being very fine, the nib on my pen behaves wonderfully. It was quite smooth to begin with— with maybe just a hint of feedback— but seems to be getting even smoother with use. I’m seriously impressed with how small I can write with this pen and how crisp my letters are. If you’re into bold strokes and ink shading, this is not your pen. But when you’re in the mood for detail and tiny writing and a fine, fine line, the Pilot Prera fits the bill perfectly. Not so sure about the ultra-fine nib? Well, I’ve heard that the Pilot Plumix medium flat italic nib can be swapped in for a change of pace. If you’re in the mood for italics, go for it! Oh, the color— lime green in all it’s shiny glory! What’s not to love?! 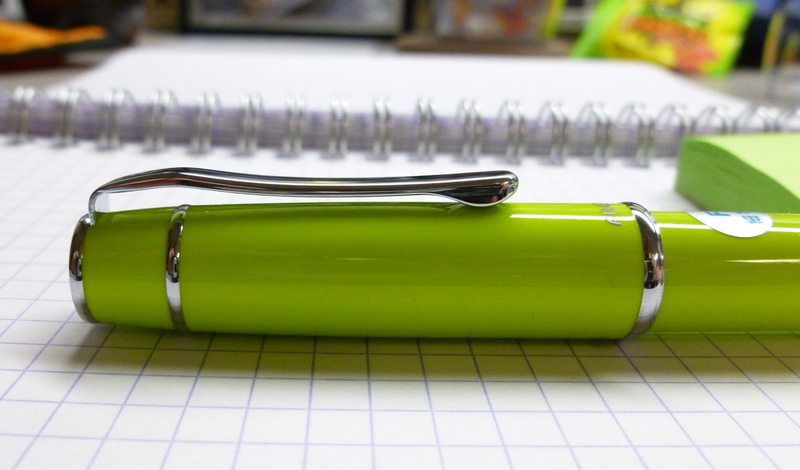 I particularly like that the section is the same eye-popping color as the pen body. It’s a stunner. You’ll have no problem staying awake at work or in meetings with this color in your hand! The chrome accents on the pen add just the right amount of polish to the Prera’s body. From the well-placed accent rings, to the clip and the mirrored end-cap, the look is both shiny and classy (in a lime green kind of way). There’s enough metal for interest but not so much that it detracts from the high-intensity color. Well played. The Pilot Prera takes Pilot’s propietary cartridges and a CON-20 or CON-50 converter. No big deal, just something to be aware of. 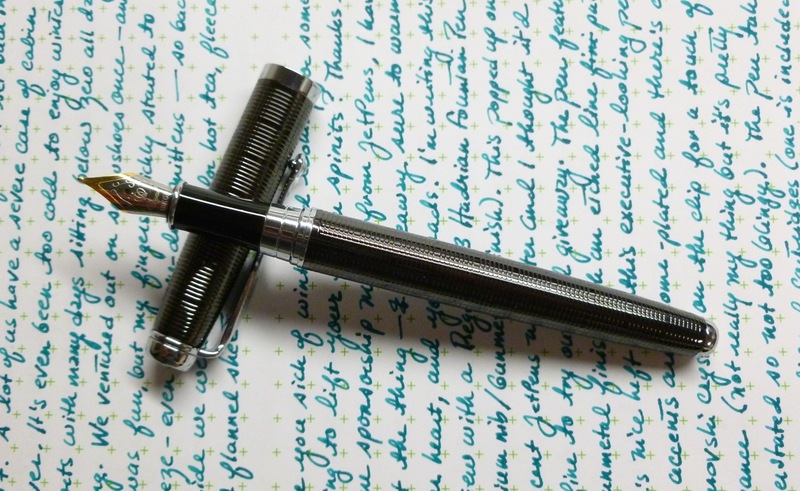 Coming in at $49.50, this is a fountain pen that’s neither inexpensive nor overly pricey. For the price, though, I have to say I wish it came with either the CON-20 or CON-50 converter, instead of just a Pilot cartridge. The price is easily justified by the pen’s build quality, but throwing in a converter would up this pen’s value in my book. Still, it’s a great pen from a time-honored company at a fair price. 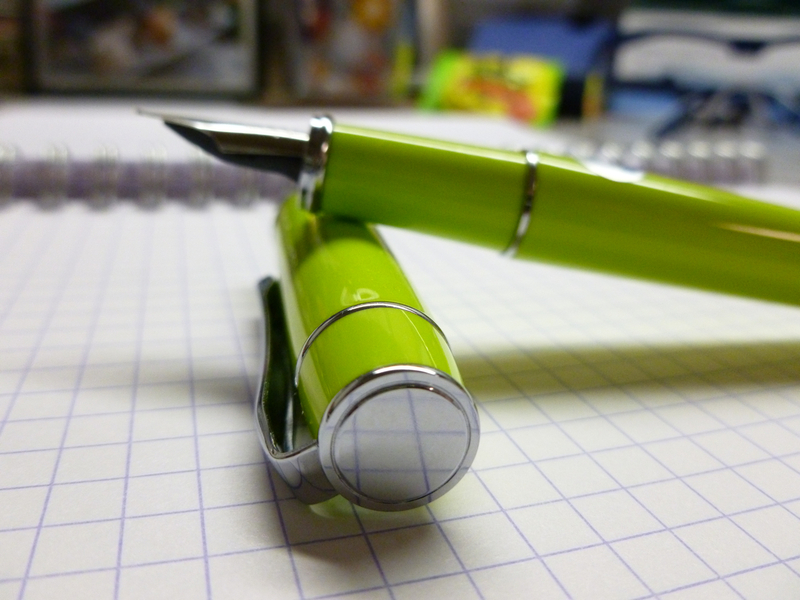 YES, JetPens has graciously offered to host and administer a giveaway so that one of my readers can win their very own Prera, exactly like the one shown in this review!! All of this pop and polish can be yours! 1) Subscribe to the JetPens newsletter by clicking on the Contest Entry Link below and entering your email address in the “Newsletter” box on the bottom right of the entry page, if you haven’t already done so. New subscribers will receive a confirmation email. Be sure to follow the directions in that email in order to complete the newsletter sign-up process. 2) Enter your email address on the same Contest Page to sign up for the giveaway. 3) Cross your fingers and hope that the pen gods smile on you! GOOD LUCK to you, and THANK YOU to JetPens!! WINNER UPDATE: JetPens selected Alex Hammond of Indianapolis as the winner of the Pilot Prera. Congratulations, Alex! Stay inked! 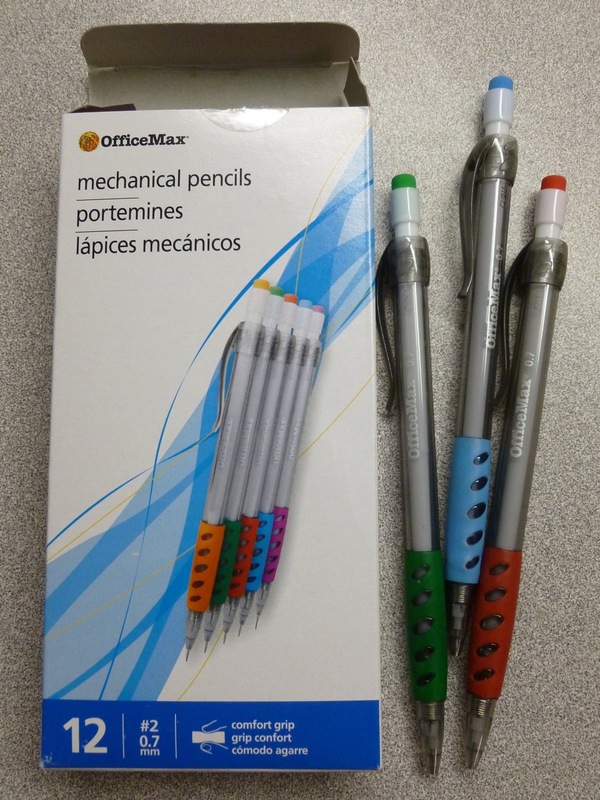 The products included in this review were provided to me by OfficeMax to facilitate this review and giveaway. I was not compensated in any other way, and the opinions expressed here are my own. I’m just back from the DC Fountain Pen SuperShow, and though I was quite conservative in my buying, I have a number of interesting purchases to share with you. But not this week. 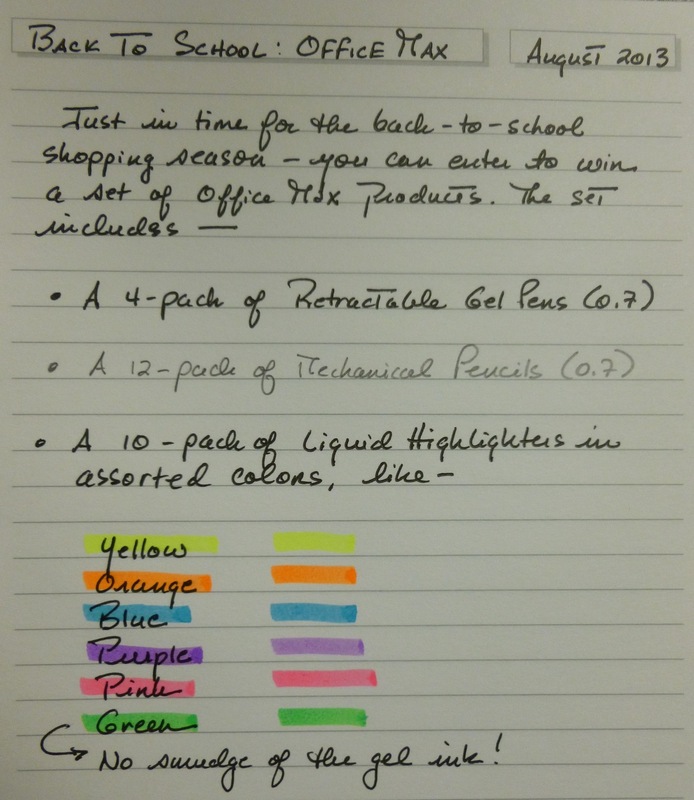 THIS week, I’m offering you a chance to win a fun selection of OfficeMax products. You know, the things students need as they get ready to head back to school. The basics, done right. 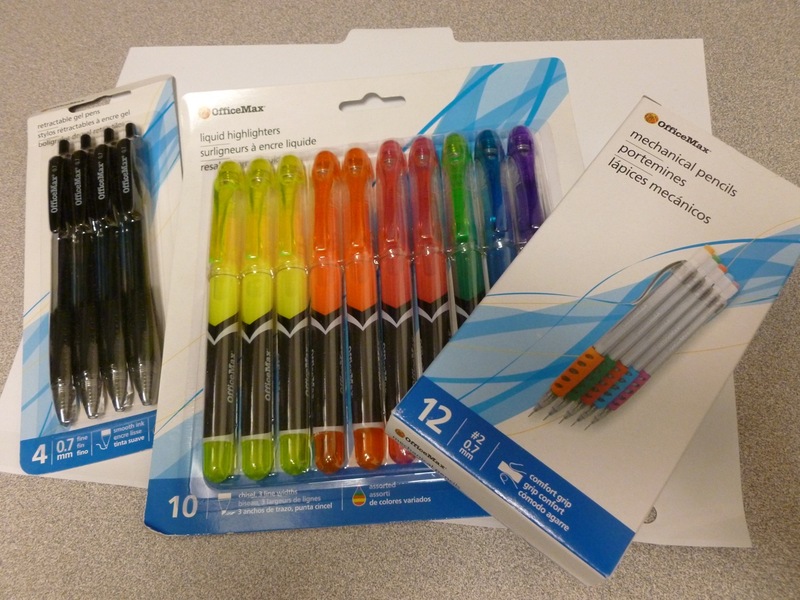 Probably the least distinctive product in the bunch, these pens looks very generic, but write smoothly and without any skips. The line is dark and solid with no globbing or clumping. 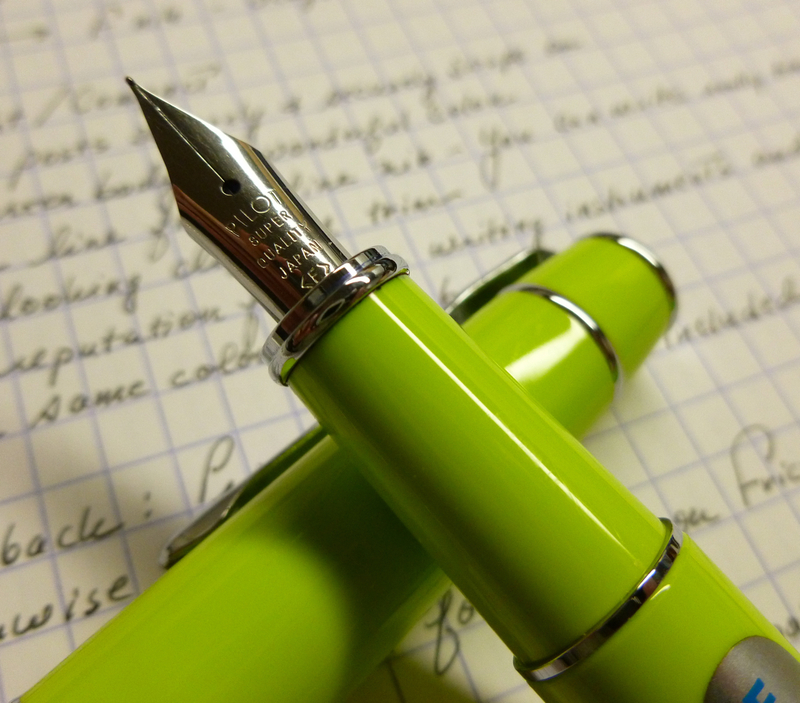 The rubberized grip makes for a comfortable, if somewhat unexciting writing experience. There’s certainly nothing wrong with these pens. Your student will love them. It’s just that visually, they lack pizzazz. 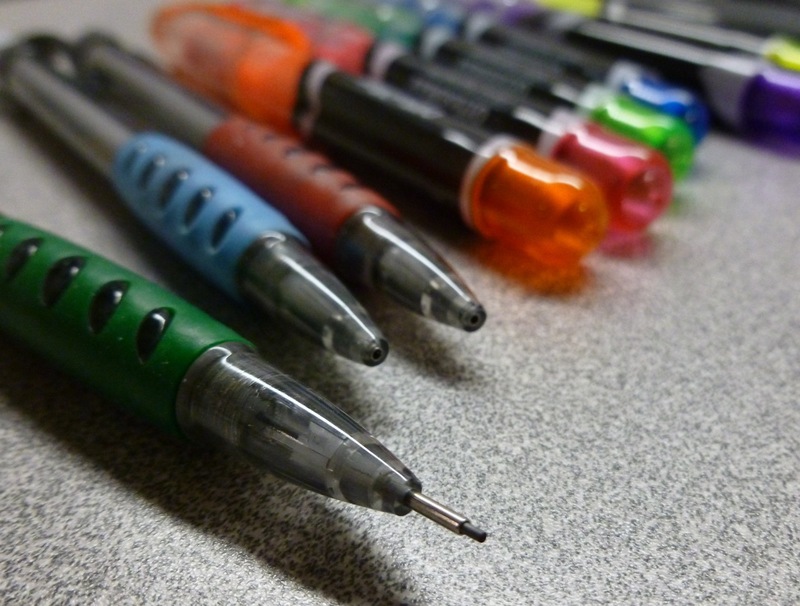 As a utilitarian gel pen, they do the job, and do it quite well. Visible ink supply means no surprises from a dry pen! I’m liking the colored grips! I gave a few of these to Laura, a student working with me this summer, and they were an instant hit! The colored grip and matching eraser are both eye-catching and functional. Laura immediately commented that the eraser worked quite well and we discussed how so often erasers either don’t work or can even make things worse by smudging what they’re supposed to be erasing. Not the case here. This eraser erases. 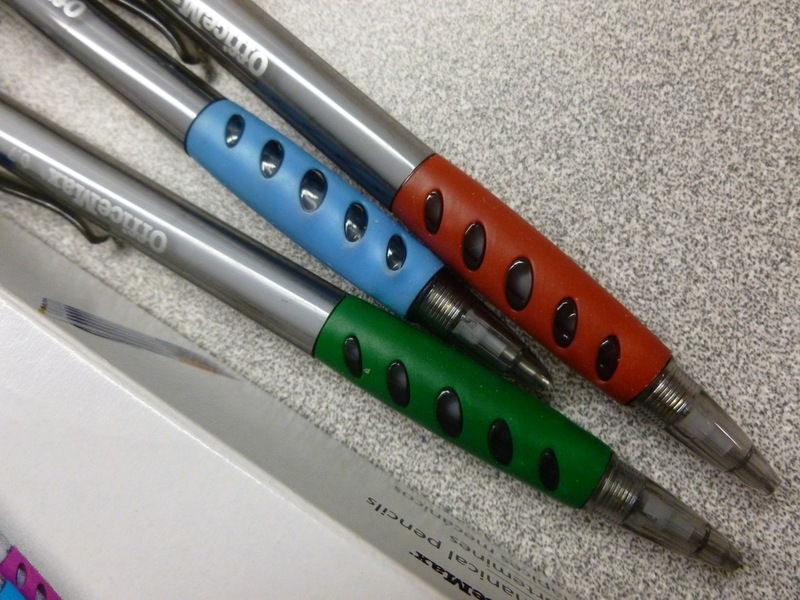 The rubberized grip provides a nice accent as well as a comfortable writing experience. Laura and I both like the look and feel. 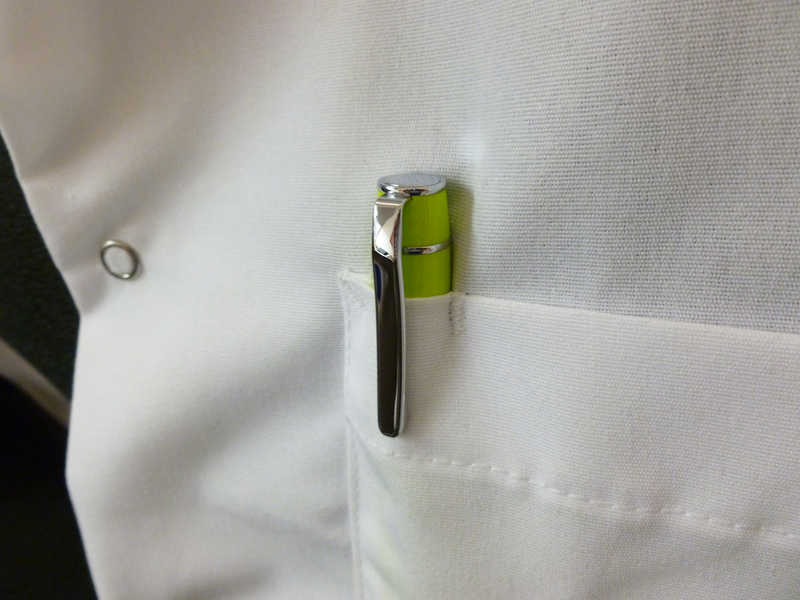 We were also impressed with the retractable metal sleeve that protects the pencil lead. Because it DOES retract, it won’t get caught on your pocket or purse…a nice touch! 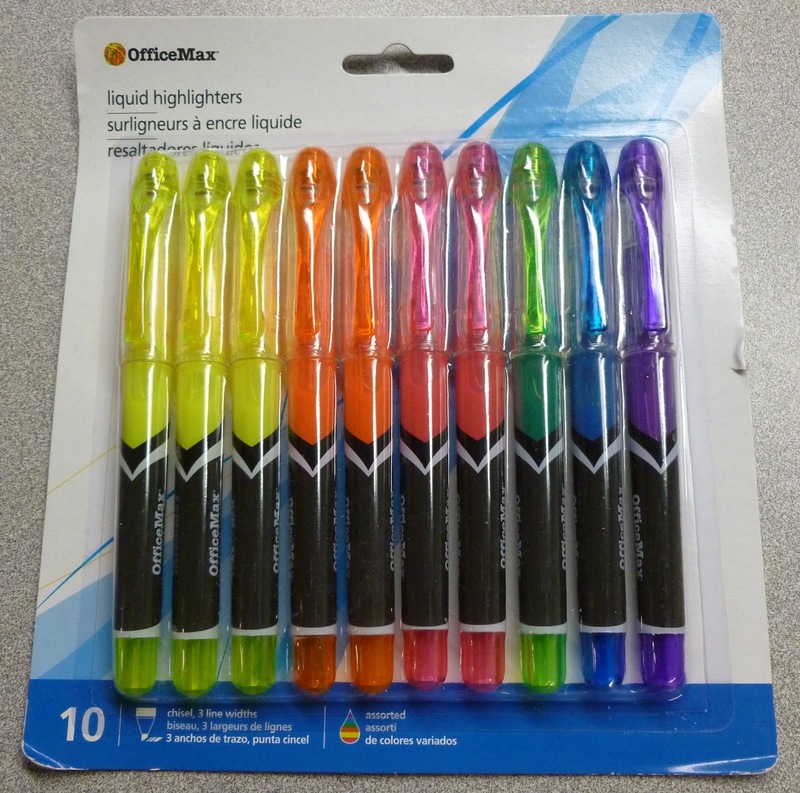 When I offered these to Laura, she was quick to select a couple of the less typical highlighter colors…green and purple. 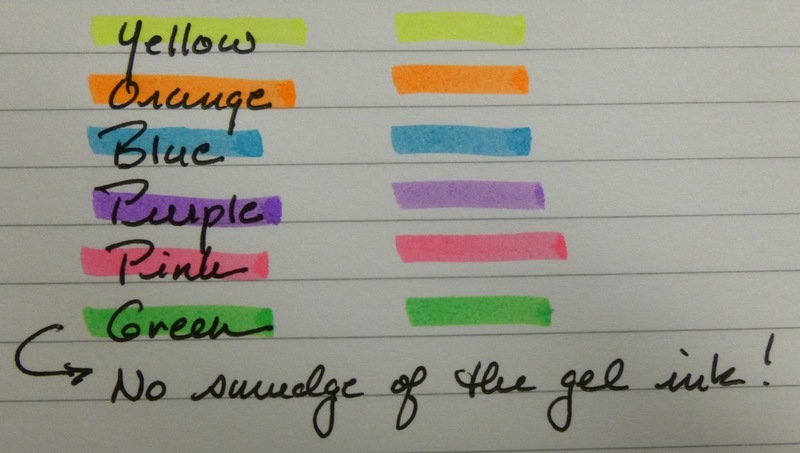 I’m partial to the orange, but all of the colors are nicely balanced- not so dark that they drown out your writing. The chisel tip makes it possible to draw three line widths, which is nice if you prefer to underline rather than highlight. My favorite part? The sloshing ink! 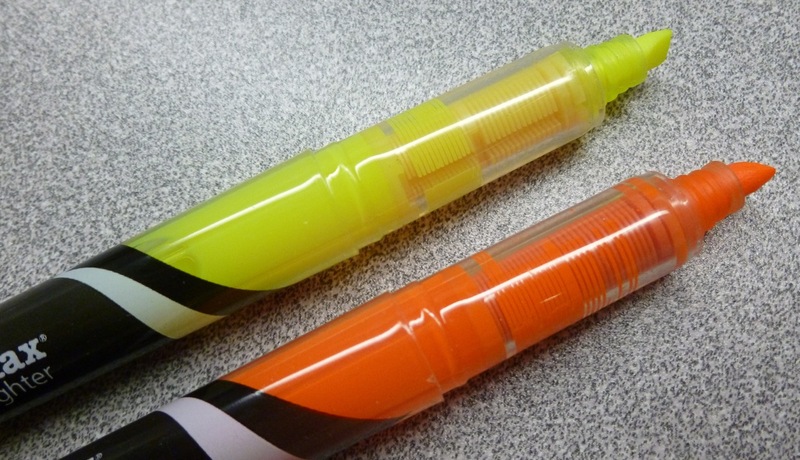 Unlike highlighters with opaque barrels, these highlighters don’t keep you guessing about the ink level. The ink is visible AND sloshable. Which might not be a word, but it’s a fun feature in a pen. The summer is winding down. Sniff. Time to dust off those backpacks and lunch boxes, and stock up on school supplies. But before you go shopping, why not try to win the products reviewed here! 1) Leave a comment on this blog by 11:59 PM Sunday August 18th. One comment per person, please! 2) Each comment will be assigned a number based on the order in which it was posted. 3) A random number generator will be used to select the winner of the set of gel pens, highlighters, and pencils. The winner will be announced on this blog the evening of Monday August 19th. OfficeMax will ship the prize package to the winner directly. 4) US residents only, please. October 31, 2012 at 7:29 pm I’d love to try the pens. And so you SHALL try the pens, marisquared! I’ll be in touch via email for your mailing address. Should I not hear back within one week, a new winner will be selected.